Pardon the non-writing related update, but dangit I had a bad day Wednesday and I want to write a post about it. Which is double unfortunate because I woke up in a great mood. I had every plan to have a wonderful day. 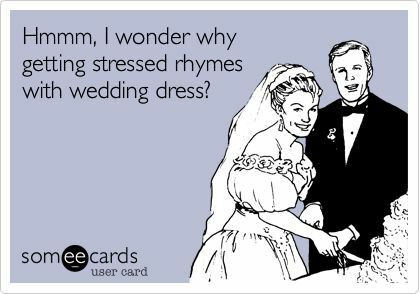 Wednesday, it suddenly hit me that our wedding was a mere 4 1/2 months away, and that we still didn’t know where the ceremony was going to take place. We’re getting married on a Saturday in June. It’s kind of imperative that we put a deposit on a church sometime soon. Brad’s family is very religious. Southern Baptist, specifically. They don’t want alcohol at our wedding reception, but that is not happening. The one big request I am trying to guarantee is that we get married in a church by a (male) pastor (their request).